This is one of the few quiet weekends I've spent at home for a while, so you'd think I'd be pleased to be relaxing with my family without having to rush around, sleep (or 'not sleep') in a strange bed or spend hours travelling somewhere. Not to mention the aggro of being away from home when you have a food intolerance. The truth of the matter is I'm having a case of FOMO ('fear of missing out') as Instagram is taunting me with images and updates from 'my people' who are mostly heading to Edinburgh Yarn Festival for the weekend. Although it might feel like I'm the only one left behind, I'm not - Louise Tilbrook even has a #festivalathome thread going on her Everday Knitter facebook group! If you're at home, or at work, or just too far from Edinburgh to make it feasible here's some consolation - I've lined up some giveaways for you (below), courtesy of some of the awesome people who are at EYF this weekend, and a couple of us who are not. For those who are lucky enough to be there, do pop along and say a big hello to see what they have on offer! This weekend The Crochet Project are launching the much-anticipated third instalment of The Shawl Project. Book 3 is all about mini-skeins. If you have a penchant for cute little skeins, or you have lots of left-overs, but don't really know what to do with them this book is for you. If you don't, you're going to want to get some. There are five truly stunning designs in the new collection and as much as the designers will hate me for saying it, they are SO beautiful they look knitted (*runs and hides*). I already have a copy of the book and the designs are amazing. Kat and Joanne have an aesthetic that we don't usually see in crochet and it's simply stunning. 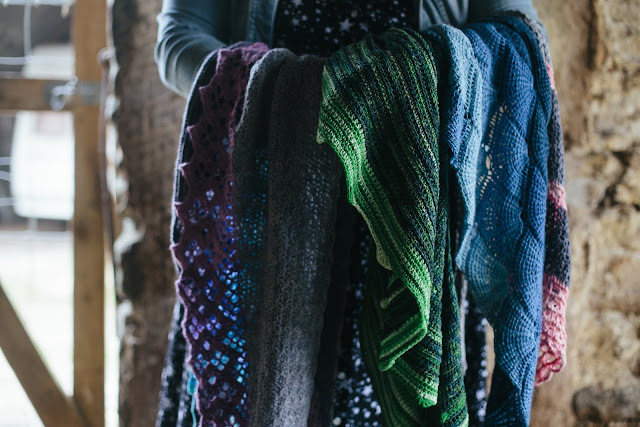 I would have already started one of these shawls, but I don't know which one to start with. Anyway, I'll shut up and just show you pictures of the details so you can see for yourself. If you click on the image below you should see a bigger version (depending on your device). The book is available in both print and ebook formats - unsurprisingly, the first print-run sold out, but you can pre-order now and get a copy of the second batch which will be shipping March 20th. Find the listing print here if you're not at the festival this weekend. Or if you can't wait and want to get started right now, you can also get the ebook from Ravelry - just £10 for all five patterns. Note that if you buy the print copy, there is a code to download the ebook included so you get both for £12 (plus p&p). For knitters who don't crochet there is something else new, that I am loving. This new collection from luxury yarn company The Fibre Co and the Japanese designer Michiyo has also just launched. The Hikari Collection consists of these six beautiful garments. Tilly Flop is one of the first stalls I always head to at a yarn festival and this weekend Julie is launching some gorgeous new products including new prints, wrapping paper and a new greeting card named *yarn* - I particularly love this motif as it includes as many different yarn and wool types as Julie could find and fit on! You'll also find something new for your car at the festival - lavender scented AIR FRESHENERS! If you're not there, check the Etsy store next week when they should be listed (if they haven't all sold out!) - check the Facebook page for updates. At the top of the post I promised some giveaways. The Crochet Project, The Fibre Co, Tilly Flop and Louise Tilbrook have kindly donated the following prizes, and I've added one too. 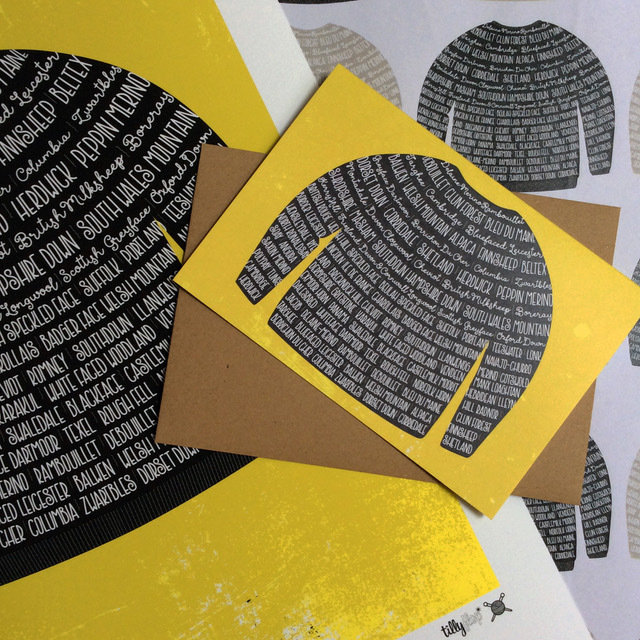 An A3 print of the new Tilly Flop sweater design in your choice of a yellow or natural background. Julie will also include a card and some wrapping paper! To spread the love as far as possible, the prizes will go to five different people. To be in with a chance to win, simply leave a comment below telling us (1) what you're doing instead of going to EYF, and include (2) whether you're a knitter, crocheter or both. Be sure (3) leave a Ravelry username, Instagram username or another way to get in touch if you win!!! I'll randomly draw the winners on Tuesday 14th March. GOOD LUCK! I'm maddy18 on Ravelry, I'm still trying to decide which new project to cast on this weekend. So in the meantime I'm working on my modular march project while my grandchildren run wild! I'm at home today as my children's school is closed for a training day. So far, I've sorted 3 loads of washing and tidied the garden and kitchen. Now i'm going to curl up with the starburst shawl i'm knitting and a fresh coffee, and drool over eyf photos on Instagram. My ravelry name is beccam71 and on Instagram I'm knittastic. I knit and crochet, and these prizes are amazing, thanks for the opportunity. I've got 2 MKAL final clues to finish the first just needs 1 row and then 523 sts to cast off! Hi,I'm knitstix on instagram and RedDevil on ravelry.Sadly I'm working this weekend but have today off so will be enjoying working on my Theme and Variation Hap along with having a stash sort out /enhancement . Hello, I'm consoling myself with the fact I have wonderwool tickets. But this weekend I'll mainly be looking after poorly little ones while trying not to get sick myself. I'm clou77 on Raveley and I can do both, I'm currently trying to master the art of magic loop socks. I'm a knitter who crochets! I crochet when I can find my reading glasses and knit when I can't! Also I'm @CraftyRie on Rav and everywhere else! Instead of going to EYF this weekend I am going to Team England ParaCheer training, we fly to America for the World Championships in 48 days! I am WendyArmitage on Ravelry and TwinklesJams on Instagram. I knit & crochet BTW! I'm laraloreleiknits on IG and I'm one of the #festivalathome crowd, so far I've done a 2 hours on an email design class and two hours knitting on a sock for DD next up is a new cast on, and later a Stephen West Craftsy class. It's so nice to know I'm not alone in my FOMO! And yes everyone's beautiful IG pics aren't helping. :D I'm working days this weekend and making significant headway on an Isabell Kraemer jumper in the evenings. I'm a knitter - @aimeekeithan on IG, museshand on Rav. Cheers! I am LiseJ on ravelry, and I knit and crochet. Instead of going to the EYF, I will be taking my boys to Kung Fu (as always) and collecting a chair I won on eBay. Let the good times roll! I'm kate818181 on ravelry and instagram. I would love to be going to eyf but unfortunately I live too far away to make it a viable possibility at this point in my life. Instead I will be knitting on my Steven West marled magic mystery shawl, after all the housework and child related activities are done of course!! I am a knitter and a crocheter, i haven't crocheted much for a while but those shawl patterns are amazing so I want to dig out my hooks right now!! Hi! I worked most of today but I am knitting for the next hour :D working on a cardigan for myself - my first adult sweater project. I knit, and do not crochet. And I'm ybutterfly on ravelry. Love all of your ideas and colour choices. So inspirational. ... I love to crochet, have taught myself how to Knook. Just finished my fourth crocheted shawl and starting a fifth. Each is a different colour to match various work outfits. I'm kennelkrafter on Ravelry (I crochet to raise money for rescue dogs) and kissandhugcrochet on Instagram. I'm in the U.S., so while a trip to EYF would be a dream come true, I'll have to stay home and work up my latest dog crochet design (a C2C). I knit, too, but just for myself. What I love best about all these comments is that I plan to look everyone up on Ravelry and Instagram--what could be better than more crafters to follow. And anyone who follows this blog must have exquisite taste. Thanks for the opportunity to enter! If I don't win, I'll just have to buy the Crochet Project eBook! I am too far away to go to the yarn fair, so I will make my own by organizing my yarn closet. I knit and crochet. Hi! I'm going to join Louise in #festivalathome. A trip to EYF would be a dream come true, but not this year. I do both crocheting and knitting, but prefer knitting right now. Guess I'm all crocheted out after doing lots and lots of CALs lately. :) Thank you for the opportunity to enter. My instagram name is hagalund107. Hi! 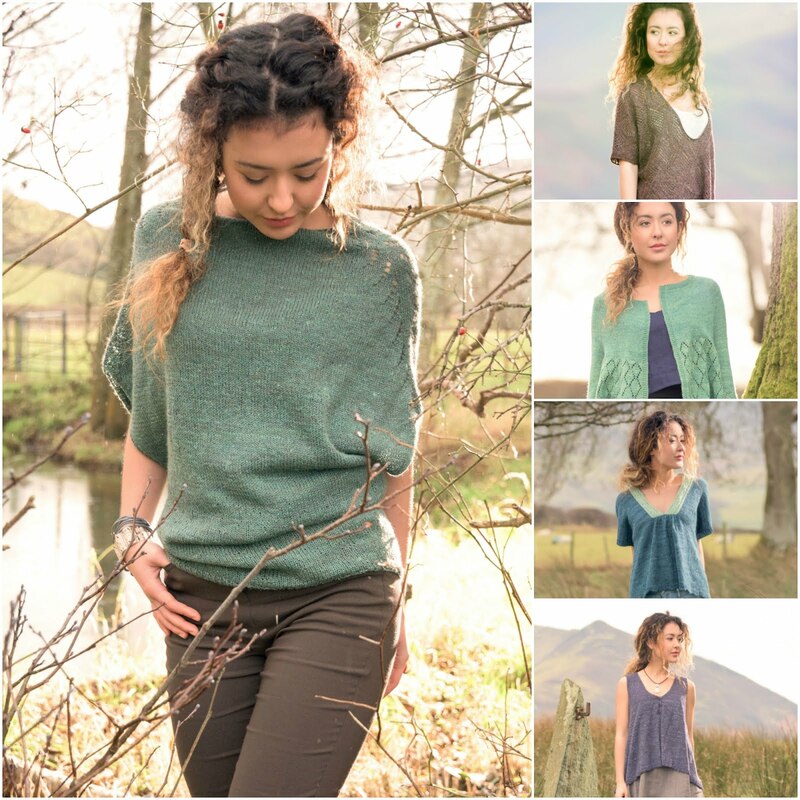 I'm too far away to justify a trip to EYF. On Saturday I'll be at the Berkshire Knitting & Crochet Guild session at Reading to attend a talk on Short Row Shaping. Then on Sunday I'll be 'cracking the whip' as my 14-year-old son does his homework, whilst catching up with my knitting and crocheting (hubby will be out at archery!) - I really must make some progress with the Jane Crowfoot Crochet Now CAL! I knit and crochet and my Ravelry name is trishrapleygiles. Great consoling giveaways, thanks - I really enjoy your blog. Having just been to the excellent Unravel and living in the South, I couldn't really justify a trip to EYF. My husband is recovering incredibly slowly from an earlier chest infection, so I'm tending him this weekend and dragging him out for a daffodil-admiring walk if it's fine. I have Knitsonik's Layter on the starting blocks and I'm fighting a losing battle against buying Scheepje's Secret Garden for 'a great big Cwtch' (pattern already bought!) I knit and crochet and am Elm74 on Ravelry. Happy Weekend from Santa Cruz, CA, where I'm dreaming of a trip to Edinburgh that includes all things yarn. But that's greedy- I was just at Stitches West in the US last month, where I immersed myself in crochet and fiber and the excellent company of fellow addicts. The amazing yarn and related goods is the stuff of fantasies (and bankruptcy ;}), but hanging out with the tribe is what I truly crave. Have a great, restful weekend home with your family, and thank you for a wonderful blog. I'm katdebrob on Ravelry. 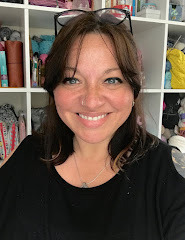 Hi I'm pinkgc on Ravelry & I'll be knitting and crocheting this weekend whilst constructing my wishlist for the Bakewell Wool Gathering in October! I'm too far away to go. Instead, I'll be taking my family to a local rock & mineral show. I crochet & knit both. My Rav ID is slawson. Hi Sharon here off instagram (soullightvibrations) I have never been to EYF it's too far for me ☹️ I will be doing chores and relaxing with my family. I'm TheRogueKnitter on Ravelry. I'll be grading my students exams and working on lecture notes for next week - with some sock and sweater knitting thrown in. I mostly knit but have recently become bicraftual. Hi Theresia! I'm NicoleV83 on Ravelry, Nicolemannak @instagram. I'm staying at home, spending time with my family. Would love to visit EYF one day. Ik love to crochet and I'm a novice knitter. Love to keep my hands busy! Have a nice weekend. This is going to sound the strangest thing ever, but did you used to work at a credit union? I used to work with a lady with the same name oh dear 12 years ago, such a nice lady. My weekend will be mainly rugby as the six nations is dominating my household! Controversially, I may choose to support Scotland because I didn't get to go to EYF. At least I will be able to get in some knitting time whilst watching the match. Hope to cast on the Shawl of Secrets as a rather nice parcel of yarn arrived from Woolwarehouse yesterday. I knit and crochet a little. My Ravelry username is sharonm4. Hi I'm sqyguy on Ravelry. I knit, crochet, spin and weave. This weekend I'm going to hunker down and absorb myself in craft; it's been a very stressful week at work. I'm angelic22books on ravelry and Instagram. I'm a knitter and crocheter. I'm having my own #festivalathome knitty weekend. I will get my Regia socks I've been knitting since January for myself finished. I have also got a Zauberball Starks 6 itching to be a hitchhiker. I've also promised my husband a pair of socks so may cast them on. I also got a delivery of loveliness with some drops fabel so may start my Christmas knitting. I've also got a huge skein of dk Regia to make myself a pair of slouchy socks for indoors. This weekend I'm suppose to start planting seeds with my daughters as they are keen to grow their own tomatoes! When not with them I hope to be making progress on my Last Dance on the Beach Blanket or looking at instagram to see what is going on at EYF! I'm flicmerrison on instagram and ravelry and I am mainly a crocheter but I'm making progress on my knitting skills by knitting socks! I will be finishing a blanket that I have been making for my daughter and son-in-law. It was supposed to be a bridal shower gift, that turned into a Christmas gift and has now become a first anniversary gift. But, I will definitely finish it this weekend. I am a crocheter and have been for many years. Thanks for the giveaway. 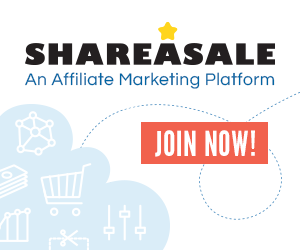 You can contact me by email at mikeginna@aol.com. I am mjm on ravelry. instead of going to EYF I am stuck at home taking care of my husband who just got out of the hospital. but don't worry, I have my spinning wheel, a couple of good books from the library and the dog to entertain me. and if my husband doesn't ring the bell on his nightstand too often I might be able to knit or spin. Oooh, do you remember that I was talking to you (online of course, duh) about going to Edinburgh and then deciding not to? (As I wouldn't know anyone, and I'm akward enough as it is). I was fine, just fine. Whatever. I mean, I have two worktrips coming up, I just came back from a worktrip in Spain, it's not like I never go anywhere... and today I see áll the Edinburgh photos... I LOVE Edinburgh and this could've been Edinburgh + yarn, I am gutted I tell you. So I was thinking... SOD this, I'll join your Giveaway and I think next year Edinburgh SHOULD be in the cards! I am a crocheter, as you know, so I'll be keeping an eye out... Happy weekend! Hi I'm pandyspinner on ravelry and @jopandy on Instagram. I'm dyeing some cheviot fleece with daffodils this weekend and looking forward to Wonderwool Wales. I knit and crochet. Yes, I want to be in with a chance to win, please! Here's my entry comment: I am reviewing the final tech edit of my ebook (of original knitting designs​) instead of going to EYF, though I love the city. I am definitely a knitter, without any real crochet skills. My Ravelry username is gkgreen, my Instagram username is gkgreenknits, and another way to get in touch if I win is by email to gkgreenknits@gmail.com ... Thank you for the giveaway! It's my sister's birthday so I've come home to celebrate with the family. @pussygalore82 on tab. I'm YannickNel on Ravelry. Instead of the EYF I'm working on a top knitted in bamboo yarn. A lovely charcoal colour. I knit and crochet. *Sigh* no EYF for me as much as I would LOVE to go. Instead I spent Friday afternoon knitting with a fabulous friend and after a weekend of juggling the more mundane housework/family commitments (including supermarket shopping with ALL my kids - something that always makes me question my sanity!) I now plan on sitting and brioching the rest of my Sunday away, fuelled by coffee and biscuits! Hi I'm jewleep on ravelry. I stayed at home and crocheted while watching Gilmore Girls this weekend. I don't knit. Hello, i am spending my weekend working at Daytona Bike Week in Florida! I am busy during my time off crocheting messy bun hats, mitts, and festival tops, etc for all he girls i work alongside of in this crazy weather that is one day calling for hats and mitts and the next bikinis!!! 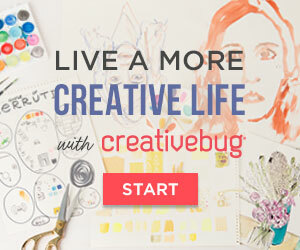 I am a crocheter, and i would love to learn knitting asap. Ravelry username is motozip. Thank u!! I'm inesn on raverly and a knitter (I also crochet but I'm primarly a knitter). This weekend, while seeing all the pics from eyf, I've decided to cast on a new cardigan!